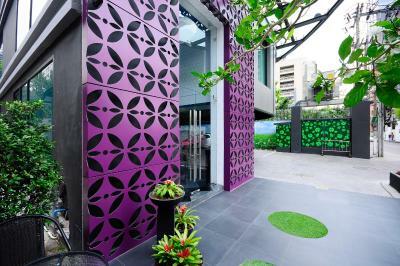 Lock in a great price for Hotel Clover Asoke – rated 9 by recent guests! The breakfast was superb. There were multiple buffet food stations and everything was well presented. A bonus was the 7th floor location that affords the diner wonderful views. The hotel location is outstanding. 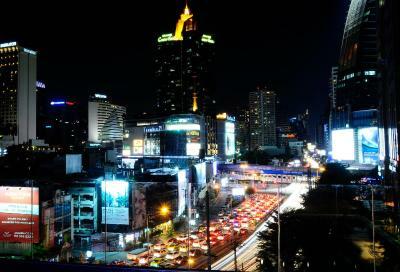 It's very close to the Asoke Skytrain stop and the MRT. Couldn't be much better. 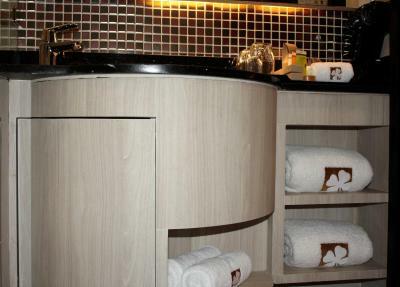 The rooms are rather small, but exceptionally well planned and have an upscale feel to them. In particular, the beds were the nicest we experienced on our trip. There is no balcony and my semi-claustrophobic traveling partner complained about that. But it's the city and a balcony would be noisy. I also liked the keypad system for the door. No more need to put signs on the handle as this was done from the keypad. Breakfast was good One can order their own egg style. Coffee and juice are plentiful. Nice rooftop view. 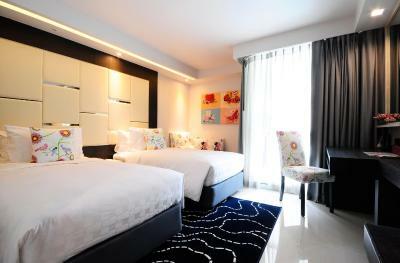 Its just an awesome hotel in awesome location (next to subway, skytrain, shopping mall, etc.) Rooms are really cool and kept clean. All in all, it’s awesome place to stay at. The location is great if you are not traveling with kids or elderlies who need stroller or wheelchair. If you do not require elevator access to/from metro, then it's really easy. The sidewalk just outside of the hotel does not have wheelchair access, so we had to ride the baby stroller on the road for a good chunk of the walk to metro, which can be quite dangerous. The convenience store just right outside of the hotel turned out to be a great help for us. Staff were friendly and spoke good English. The hotel is located close to the BTS station which makes it easily accessible, there is also a 7/11 next door which is also convenient. The room was spacious and very clean. Staffs are very friendly and helpful. 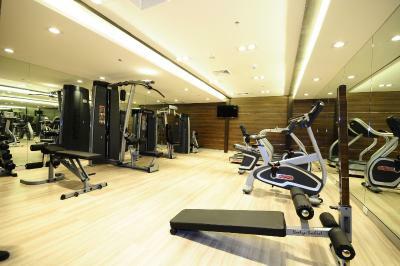 The location also really great, just a few min walk to BTS and there is a convenient store just a next door. 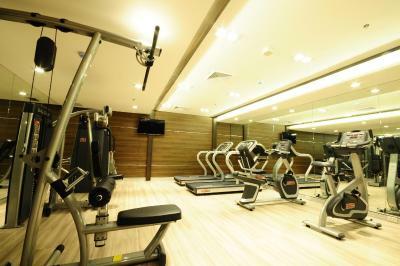 Hotel Clover Asoke This rating is a reflection of how the property compares to the industry standard when it comes to price, facilities and services available. It's based on a self-evaluation by the property. Use this rating to help choose your stay! One of our best sellers in Bangkok! Located 1,300 feet from Asoke BTS Skytrain and Terminal 21 Shopping Mall, Hotel Clover Asoke offers an outdoor pool and free WiFi access. 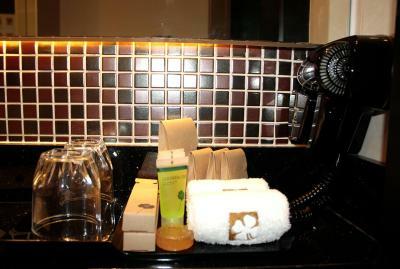 Every air-conditioned room includes a flat-screen TV, a mini-bar and and a seating area. There is also a private bathroom with a shower. Free toiletries are provided. Guest rooms are also available on a ladies-only floor. With easy access to the city's center and various office buildings, Hotel Clover Asoke is a short walk from a park and nightlife options. 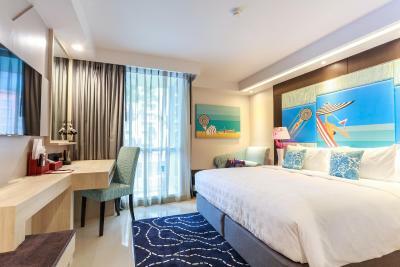 The nearest airport is Suvarnabhumi International Airport, a 40-minute drive from the property. 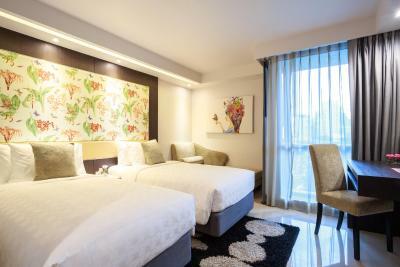 When would you like to stay at Hotel Clover Asoke? 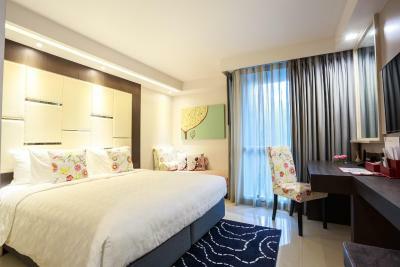 This twin/double room features air conditioning, a flat-screen TV and a mini-bar. 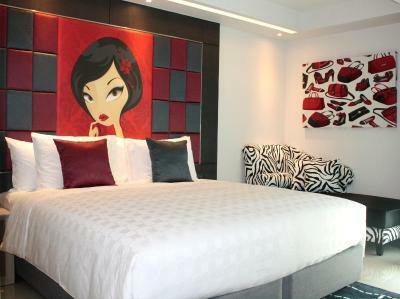 Located on the female-only floor, this twin/double room features air conditioning, a flat-screen TV and a mini-bar. 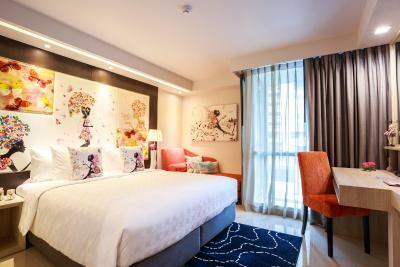 Hotel Clover Asoke welcomes you to experience our 88 modern-luxury, boutique styled guest rooms with our unique Ladies Floor, and outstanding location in the heart of central Bangkok. 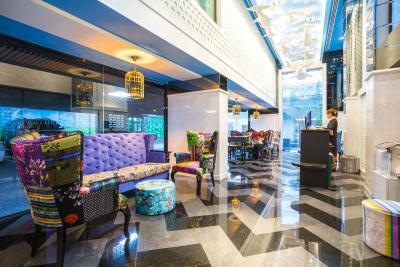 House Rules Hotel Clover Asoke takes special requests – add in the next step! Hotel Clover Asoke accepts these cards and reserves the right to temporarily hold an amount prior to arrival. 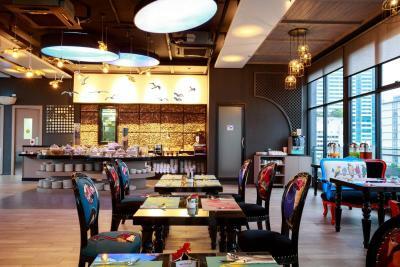 Please note that the name of the credit card holder must be the same as the guest's name and credit card must be presented to the property upon check-in. If the same credit card is not provided, a new payment will be required. Please also note that the hotel reserves the right to preauthorize the credit card prior to arrival. Staff were very professional and friendly. Came in super drunk at 5AM and got a late check out for free (excellent service). Pool is lovely - superb views up there. Room was very clean, and lots of nice little touches. This is a fantastic hotel. the breakfast could have more choices. the swimming pool is good but better if bigger. the restaurant is good and we have all our meals there. the staffs are really helpful and nice and they help us a lot! Only 1 key card is given for 2 people. The water of the swimming pool is a bit dirty. Location is perfect. 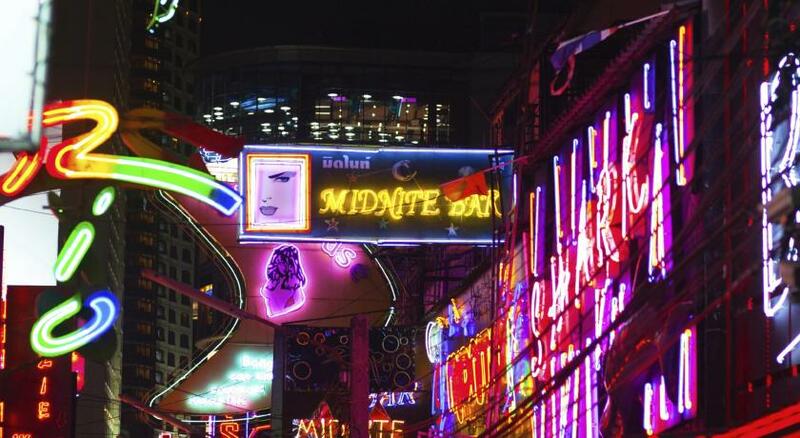 Just 5-minute walk from Asok BTS station. Quite a number of restaurants nearby and some run for 24 hours. We had booked the standard double room which was to small and claustrophobic So had to pay extra and get a upgrade to their executive room. The hotel was good but I don’t understand the 9 rating. The bed was super comfy. Bathroom too small for the room size. The tv was placed in the middle of no where not facing the sofa or the bed. The breakfast area was nicely decorated and had a good view. The lobby was very tiny. Buffett breakfast had many food items that are not usually at a breakfast buffet. Food was very average in taste and flavour. Front desk staff were polite, friendly and helpful. Bed and pillows were fantastic... very comfortable nights sleep. Room was nicely decorated. WiFi was good. Water pressure in shower was good. Roof top pool area (while small) was great. Lovely views over the city. Very well located, near the bts and metro. Shopping and convenience stores near by. The rooms are spacious and clean. Good breakfast. Location perfect and the hotel was spotless. 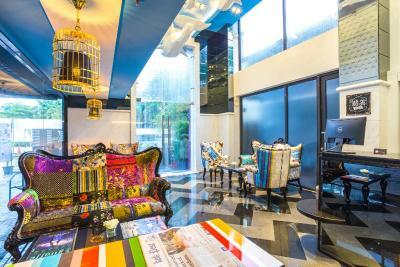 Beautiful and artsy hotel, at a very convenient location near Asok BTS and Terminal 21. They took a little while to check us in as I think they needed to combine the twin bed room into a double bed, but it was all good. Bed was very comfortable, breakfast buffet and bar on the rooftop was nice. 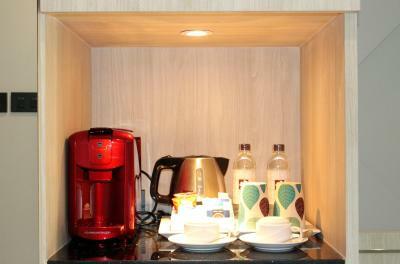 Staff were very helpful and forthcoming as well, and provided us with free minibar and welcome drink. The front step made my mother fall on arrival the 1st day. The little step should be evened out with the rest of the lower ground to avoid people tripping over. 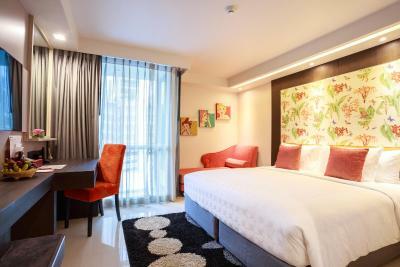 Everything about the hotel was great: the location is ideal, just next to Asoke station for the BTS line, the hotel is super clean and comfortable, the morning breakfast is good as well. Appreciated the free snacks in the room. 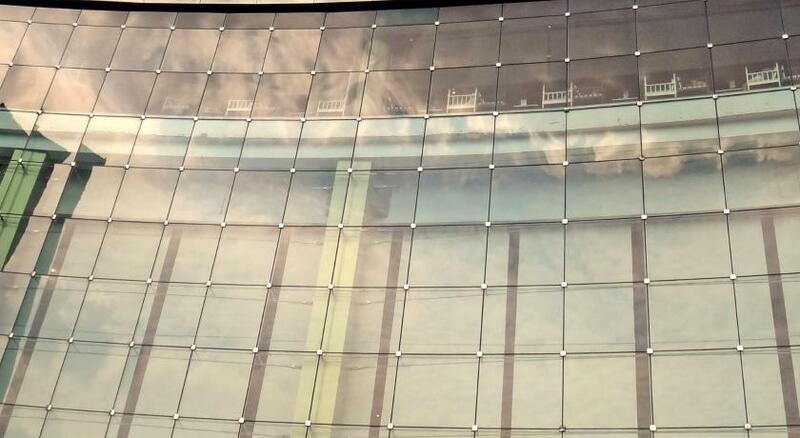 The tiles and glass panels around the rooftop pool could be cleaner. Apart from that everything was great! We stayed here two weekends in a row and were upgraded both times! Staff were very helpful and friendly. Rooms were spacious and comfortable. Breakfast buffet was good. Enjoyed the rooftop pool and bar area. Woody and Julia checked us out this afternoon and sorted our taxi to the airport. 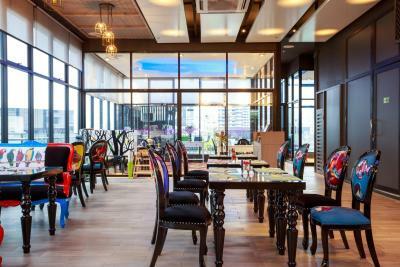 A great stay in Bangkok at Hotel Clover Asoke! Although the hotel is not directly responsible for this service, but given the standing of the hotel I would appreciate that the hotel calls on a trusted taxi driver. I had to pay the race plus the highway fees. The amount is certainly ridiculous, but the process very doubtful! Room is not much of soundproof, but it's a little thing for me. I like the hotel location and style of the hotel. I like the room size which is not too big or too small for me staying alone. There is a 7-Eleven next door and you can reach to business buildings around the hotel easily. 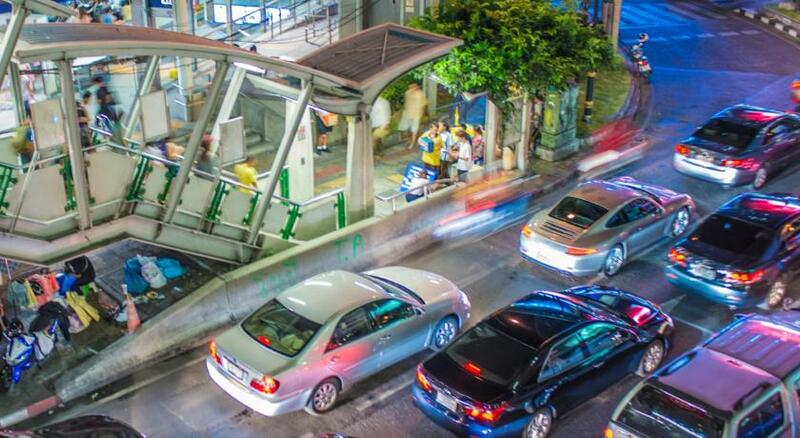 Walking to Sky Train (Asoke station) and Metro (Sukhumvit station) is just 2-3 minutes. Hot water works very well, just within a minute. Water pressure in bathroom is so good. Only slight negative was the glass surrounding the pool needed a clean to fully appreciate the great view. 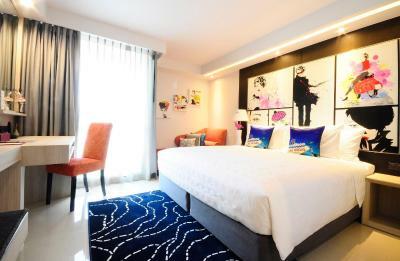 Modern and funky hotel in a fantastic location.